This summer Ladon has awakened once again to guard the blooming golden fruits in the Garden of Hesperides. If you get past him you’ll be able to taste our carefully selected golden tracks and fill your mind with powerful and ritualistic psychedelic music. Be very careful; if you stop the music Ladon will get you! 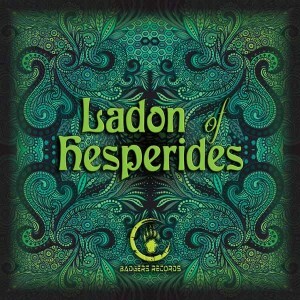 Ladon Of Hesperides is compiled by Hora Project, produced by Jyro, and released in 2015 by Badgers Records, a free netlabel based in Athens, Greece. Mastered by Nik Mar at Pupsidelic Media with artwork by Anna Foundinaforest. Special Thanks to Anna Foundinaforest for her awesome handmade artwork, to all artists for their killer music and to all you Badgers for your support. You know who you are! Cannibals enjoy. MP3 Download | FLAC Download | WAV Download · Download count: 14,107. “Meden Agan” is in my favorite best forest list ! respect to all other artist. top quality from a top quality label :) Nice work everyone, very enjoyable journey! Oy vey. What a lineup, huh? No hesitation in downloading this gem, with everyone involved! A mind-bending collection, if you ask me. Now, back to the headphones for more of the goodness!! Really proud for this one!! Much respect to all those artists who share their killer music with us all! Congrats to Pupsidelic for doing his best shinning those jewels! Big up to Horaproject for compiling this Bomb! And of course a Big Applause for our cover artist , Anna FoundinaForest, for her ‘out of this world’ Handmade Fractal Art!! Big thanx Alexander for this portal that unites us all and to all you Badgers for sharing this VA! Quality forest psy for free, good job everyone. congrats for such nice relese!!! amazing journey! Дракон в компаниях изредка lsd meueheheh once again great rls. keep the good work guys . hey guys, ive tried to download the wav version of this a few times and only one track downloads all the time. Is it me or is the wav link not working properly? ShayShay i just downloaded wav (to check) with no problem. I guess it’s your connection..
Open Psychedelics is an absolute masterpiece.